About Shot Nov. 21 near Bancroft Ontario, during the Rally of the Tall Pines. Canadian Rally Championships. One of the factory backed Subaru WRX Imprezas goes into a corner a little faster than most of us in our right minds would attempt. Thanks for the Best in Project Award! Thanks for the comment on this one. Here is a url that shows this image as it was when I entered it in the Yokohama Spirit of Performance photo contest. This one didn't win. But, the image of the orange Mitsubishi EVO did win the second quarter action division. I have since found out that the driver of the orange Mitsubishi is also the Yokohama tire rep. and also one of the judges. 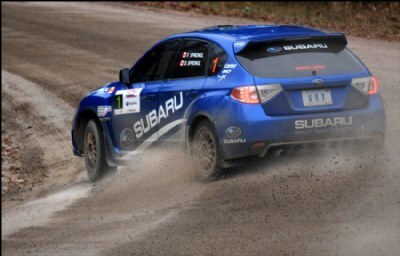 If you go to that site, you will see more of my rally images from the Tall Pines and many other phototgraphers images. The best areas to get action shots are the up hill banked viewing area leading to the "Iron Bridge" and the Iron Bridge itself. The Tall Pines Rally has a website with all the info you need. It's a fun day, but dress warm. My brother and I usually go up on the day of the Rally, leaving Toronto early to get to the paddock to get some pictures before the start. Then we all watch the cars start down the ramp in seeded order. The next thing is all the spectators get in their own cars and drive a few kilometers to the viewing areas. Remind me again when it gets closer to November, maybe we will run into each other there. Nicely done Andre! So I'm thinking of attending the Tall Pine Rally as Bancroft is not that far from Renfrew. Any tips on good locations for great shots? Do you know of a place where the cars get air? Thanks for commenting on my rally photos - truly appreciated my friend! Absolutely true Nick. It's much better to slow down the shutter and pan the camera for effective looking motion blur. Same with me Andre. That "motion blur" filter has a very obvious result in the sense that one can really see that it is not quite... "motion blur". It doesn't convince me at all but of course it is also a matter of exercise and working methods. I would rather prefer something like narrow DoF or real motion. BTW, moving objects get a very "thin" and "airy" look when captured with slow speeds, especially humans, animal, etc. I don't see that coming so well formed from using that filter. This is just because the filter will apply a "uniform speed" to all parts of the obkect over the whole amplitude of motion and this doesn't happen this way with lovong beings. For example, the legs of a cat move much faster than the cat does itself when it is going quickly, and so the legs would appear more blurred than the body, and so on. I hope I was understandable here. Great car and action shot Andre! I agree with you about using the Photoshop motion blur filter. I don't like using it at all. Some people might be much more skilled at it, and can blend it nicely. The only time I ever use a blur filter is if I want to lessen a distraction from some obviously unwanted background element. Even then, cloning is usually a better way to go. Indeed, glare can be a nuicance but it can also turn to a bog help for enhancing the "metallicity" of the object. So, in case the are enough details it seems to be rather a helper than a problem. And here we have way more than "simply enough" details so that the glare is an additional plus for the image. Now I also see that it enhances another difference between the car and the rest of the scene. The car seems so "glossy" while the rest of the scene is rather "matte". Thanks for coming back for a visit and some comments Ray. It's nice to know that some people think enough of your images to take some time out of their day and come back regularly. I was very fortunate with the exposure on the car in this case. One of the challenges with shooting cars in uncontrolled situations, racing or not, is major glare. I even notice glare as a problem in some professional images. I suppose there is nothing wrong with a little uneven exposure due to glare because it appears quite natural, as your eye would see it in real time. In still images, we have plenty of time to be critical and we always want to see as much detail as possible. So, in this case, the light cooperated. I would have liked to try more "pan" shots with lower shutter speeds to emphasis the speed of the cars with intentional blur. However, we didn't stay for the last run and I didn't have time to do that and most of my images from this race are of the "frozen action" variety. Oh well, if this is not a big good part of the signature of our Andre! ;-) Yes sir, it is again that running machines of good craftmanship as seen so many times in your portfolio! The blue tones if the car replay so well that "metal finish" of the special reflections on such surfaces, and still I see neither overexposed nor under exposed parts on the vehilfe. And so also the good gradients were preserved that tell us much about the shape of the car in 3D-space. Great details with perhaps some tiny pixelation on the contours of the white letters against their dark background but still in the range of good sharpness for an image. And as about composition in conjunction to timing, I guess that one of your absolute top areas of photohraphy is exactly this great way of freezing up the moment of fast motion, Andre. The wondefully taken flying dust and small stones behind the car tell me that readily. Stay on that and post some more, please! I'll be putting a couple more in this week from the same rally. There will be a couple more to come later this week. I'm glad you like it. I will post a couple more action shots from the same event later on. Great action shot, Andre! I like the way you've captured the dirt and gravel being thrown up behind the car.